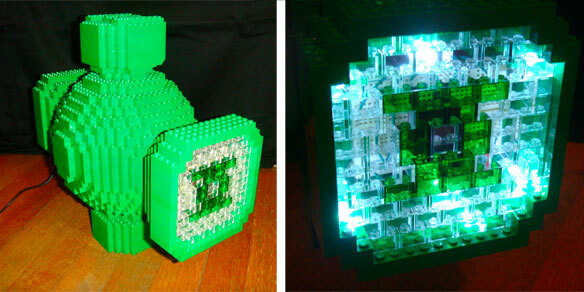 Justjon (real name Jon Lazar) has constructed an operational Green Lantern power battery from Legos. I'ver seen a lot of cool sh#t built out of legos (thank you internet) but this one may take the cake. It's plain awesome and damn original. Jon's power ring uses RFID technology to communicate with the Lego lantern in much the same way that a lot of security locks and megastores use it to open doors or track merchandise. In this instance, though, it's a lovely piece of technological overkill. "The power battery was done from start to finish, including all of the electronics, over the course of a month" Jon told Comics Allaince. So how true was Jon to the original design when constructing the power battery? "When building the power battery, I veered from the actual design in two places. The first is the handle. Hal Jordan lifts the lantern with a handle that runs off its sides, but the weight of Lego and the lack of strength of the handle seemed like a poor idea in case someone got the idea lift it by the handle. The second design change was to add a Green Lantern symbol in the front of the Lantern so it would glow when the lights fade in and out." You can see a quick demonstration of the power battery in use below. The battery has already made an appearance at the World Maker Faire and may be appearing in other venues soon. Concerning future plans, Jon says, "I do plan to build more comic book "props" out of Lego and am currently trying to decide what will be next. Since I've done a major DC one, I think a Marvel related one is likely to be next." Jon says he is also always looking for new ideas, so why don't you leave some suggestions for him? that one looks better than the one they are using in the movie.